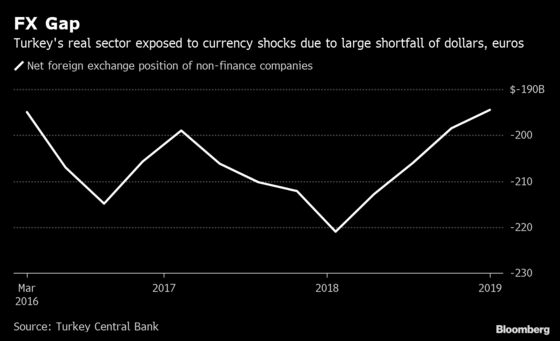 (Bloomberg) -- Turkish companies are struggling to get off the hamster wheel of debt as foreign borrowings run near record highs. The reason: a plunge in the lira that has driven up the cost of their obligations in dollars and euros. Banks are being left to carry the burden amid a surge in demand from some of the country’s industrial giants to restructure their liabilities -- on top of a jump in bad loans. Lenders are also pulling back on providing new credit as the financial system comes under increasing pressure from the recession and an inflation rate of almost 20 percent. While the lira has recovered from the all-time low it hit in August, the currency is still down by a third against the dollar since the beginning of 2018. The result is that Turkey Inc.’s debt amounts to 40 percent of gross domestic product, exceeding ratios in Eastern Europe’s 10 biggest emerging markets and that of South Africa, which together averaged 22 percent, according to data compiled by Bloomberg. Having to re-arrange borrowings is adding insult to injury for lenders that have seen their valuations more than halve over the past three years. 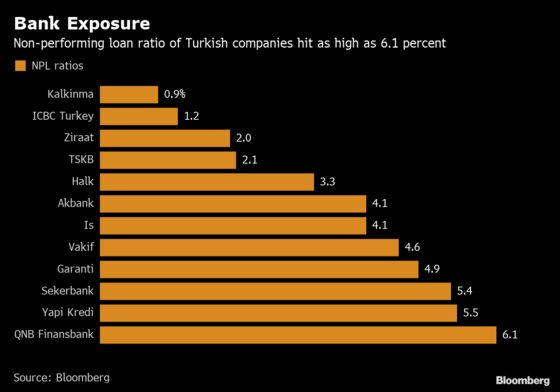 Efforts by President Recep Tayyip Erdogan’s administration to prop up growth by stoking a credit binge -- and leaning on banks to lend at rates barely above inflation -- are biting borrowers and lenders alike. The leader on Monday intensified his push for a rerun of last month’s election in Turkey’s biggest city, Istanbul, fueling concerns that an authoritarian streak in government is deepening. The buffer banks have against any shocks looks “dangerously thin,” Noetzel said in a note on Friday. 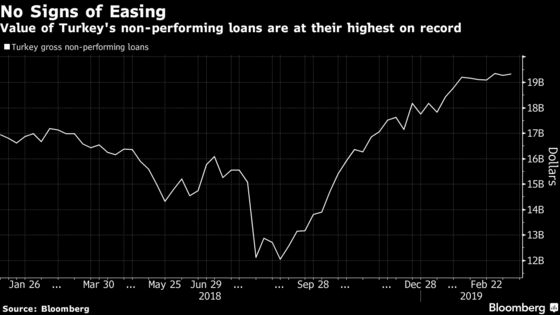 NPLs have swelled about 13 percent this year to $19.3 billion, which means a deeper-than-anticipated economic contraction or renewed pressure on the lira could erode the estimated $27 billion in pre-provision operating-profit cushion the lenders have, he said. Renewable energy company Bereket Enerji Uretim AS was the latest firm to ask banks to reorganize $5 billion of loans. 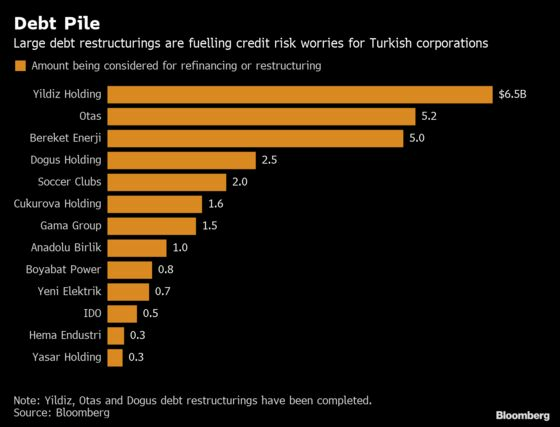 That means Turkey’s largest companies have either completed or sought at least $28 billion of restructurings, up from $18 billion a year ago, according to data compiled by Bloomberg. Other companies are also weighing their options. Cukurova Holding AS, a founding stakeholder in the country’s biggest mobile-phone operator, is considering asking state-owned TC Ziraat Bankasi AS to rejig a 10-year $1.6 billion loan taken in 2014. Ferry-boat company IDO is working with Lazard Ltd. to restructure $500 million. More than half of the liabilities of Turkish companies is to banks based in the country, over double the ratio in 2008, according to central bank data. Non-performing loans as a percentage of total credit rose to 4.11 percent in February from 2.95 percent at the beginning of 2018, according to the banking regulator, which predicted the ratio could climb to 6 percent this year. The energy industry alone has more than $51 billion in outstanding debt. All of Turkey’s large infrastructure projects, including Istanbul’s $11 billion new airport, are financed through foreign-currency loans taken out mainly with local lenders. Their ability to repay is hindered because most of their income is in lira.